OUR guided tour of the famous museums at the Vatican City got off to a decidedly ropey start. Guide Filippo Brancazi, an energetic Italian in his late 60s, first stopped to have a lengthy and loud argument with someone who had (possibly) been left behind on his morning tour while we waited awkwardly nearby in the blazing Roman sun. We'd already had to change buses twice in about five minutes. Finally Filippo forgot to remove his microphone before using the men's urinal, so the 15 or so of us wearing the transmitting earpieces got to hear him having a wee. Oh dear. At €55 ($95), this was looking like an expensive mistake. Happily, it didn't take long for Filippo to earn his euros. Bypassing the queues and going straight into the museums is one of the main reasons for going with a tour guide - I'd learned this lesson the hard way the last time I had visited Rome - but Filippo was also knowledgeable about the beautiful artefacts we passed on our three-hour visit. In addition he was funny, humble, spoke seven languages ("but not New Zealander") and had little time for the belligerent bunch of Aussies at the back - or the women who wanted to start the tour in the gift shop ("Mamma Mia!"). 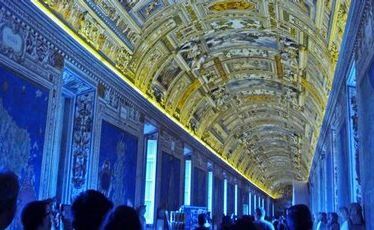 Of course, three hours is by no means long enough to visit even a quarter of the Vatican Museums' many treasures, which are housed in 1500 rooms. But I certainly felt I'd seen the best of the bunch.By the time our tour was up, I'd forgotten all about the urinal sound effects and was truly a member of the Filippo fan club. The tour began in the light and airy Pio-Clementino Museum, before winding through the Candelabra Gallery, the Tapestry Gallery and the Maps Gallery ("Google Maps of the era," said Filippo) before reaching the Sistine Chapel, La Cappella Sistina. After 15 minutes of admiring Michelangelo's famous ceiling and Last Judgement fresco, as well as works by the likes of Botticelli and Rosselli, we exited the Vatican via St Peter's Square and, finally for the eager beavers at the back, the main gift shop. Here you could buy all manner of Pope-emblazoned objects or even bits and bobs blessed in His presence. I went for a couple of calendars for the fridge after I disappointingly failed to find a Pope on a Rope. The tour of the Vatican Museums was the most touristy thing I did on this revisit to Rome. One of the best things about returning to a place you've already been to as a tourist is that you've probably seen most of the major sights, so the pressure is somewhat off. It gives you the chance to visit places you may have missed last time - hence my trek to the Sistine Chapel - or want to see again. Best of all, it gives you a chance to soak up the atmosphere and actually enjoy the daily life of a place. Rome is a great walking city, though it is well-served by two underground train lines which connect most of the major attractions. The Hotel Savoy, my accommodation for two nights, is located in the centre of the city, 10 minutes' walk from the Spanish Steps and 20 minutes from the Trevi Fountain. A revisit to both of these beautiful landmarks was no great hardship, but I was more interested in finding less-obvious city destinations. Opposite the Steps, and their cluster of dodgy individuals selling knock-off handbags, is what must be one of the most expensive shopping streets in the world. Via Condotti is home to almost every luxury boutique you can think of, including Dior, Gucci, Bulgari, Valentino, Yves St Laurent, Prada and Armani. It is also home to the Antico Caffe Greco, the oldest literary cafe in Rome, which is thought to have opened as early as 1743. Regulars here included John Keats, Lord Byron, Nikolai Gogol, Giacomo Casanova and Hans Christian Andersen. After a spot of window shopping, I picked up a €3 meal of zucchini pizza and a cold beer, and headed for the gardens of the Villa Borghese, another spot that I'd missed on my last trip to Rome. The 80ha park, also a few minutes' walk from the Savoy, was the former residence of the noble Borghese family. In 1903 its impressive grounds, which house several museums and temples, landscaped gardens, a zoo, an artificial lake, a puppet theatre and Cinema dei Piccoli - the smallest cinema in the world - were bought by the city for public use. I sat on a shaded bench and scoffed my pizza while watching red-faced tourists puff their way round the grounds on rented bikes, dodging smartly dressed locals who had obviously ducked into the park to eat their lunch. La dolce vita - the sweet life, indeed.